If you open your Apple Store(s AAPL) app on Friday you’ll see something new: a free content giveaway, courtesy of Apple. Under the “Stores” tab, choose any store and you’ll see the first item pop up says “A game for you. 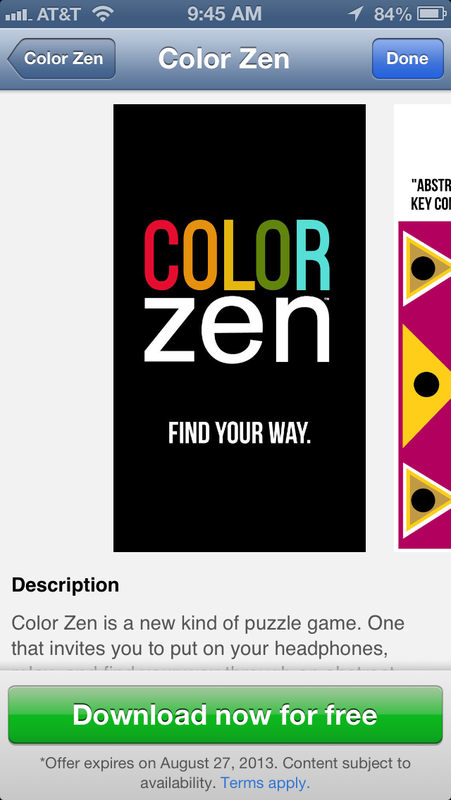 On us.” This is a free third-party app, Color Zen, that Apple is giving away. This offer is good until Aug. 27. 9to5Mac reports that Apple is going to make it a weekly thing, and won’t limit the free giveaways to apps; it should include games, songs/videos and ebooks. The process is a wee bit clunky: once you choose the “download” option, it pushes you out to the App Store app and brings up the Redeem section with a code pre-entered. From there you tap again to agree to redeem the free code. It’s similar to if you picked up a free app card from Starbucks(s SBUX). Why is Apple doing this in the Apple Store app and not the App Store? Apple won’t say. But the company has been looking for ways to get even more buyers into its stores. (While you can download the free content while you’re not in a store, the idea is to see it while you’re in an Apple Store.) As illustrated by the Wall Street Journal on Thursday, Apple’s usually high in-store traffic and revenue numbers slipped a bit during the most recent quarter. But, as Asymco demonstrated earlier, Apple Store numbers tend to ebb and flow with the popularity and success of new Apple devices. There were no new iPhone or iPads during the last quarter — except for some new MacBook Air models. So that’s what Apple has to work on: getting people into its stores in the off months. Those months are becoming more numerous of late as Apple last fall purposely clumped all of its new product launches in the same holiday period. CEO Tim Cook has reportedly told retail employees he wants more iPhone sales to occur in Apple’s own stores rather than partners and carriers. He wants to use special offers — perhaps like this — and Back To School discounts and free app store credits as part of it. I get the same error. It worked once before for the last freebie, but now just keep getting error message. Not working for me. Keep getting error message “Cannot Open App Store”. Have found app in App Store but it’s 0.69p. Any ideas?